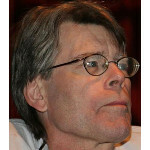 Stephen King is one of America's most celebrated authors of horror, fantasy, and science fiction. He is the author of such classics as Carrie, The Shining and The Stand. Many of his books have been adapted into successful movies at the box office. One of his more recent works, Under the Dome, has been adapted into a successful television series. My personal all-time favorite is Stephen's second novel Salem's Lot. Stephen King's father has always been somewhat of a mystery. He reportedly abandoned his family when Stephen was just two years old. Because of this, there appears to be a lot of misinformation regarding his father's parents. Donald Edwin King, Stephen's father, was born as Donald Edwin Pollack, son of William and Helen (Bowden) Pollack. Donald's father died when he was young and his mother was remarried to Victor Szczepanski (aka Spanski). After their mother remarried, Donald and his sister Betty kept their names Pollack. Sometime later for reasons unclear, Donald changed his name to King before marrying Stephen's mother Nellie Ruth Pillsbury. While researching Stephen King's ancestry, I came across an unusual crime committed by one of Stephen's ancestors. At the age of 39, his great-grandmother Hattie (Clear) Bowden, wife of William Bowden, was convicted of blackmail in Peru, Indiana. Mrs. Bowden pleaded guilty to having sent anonymous letters to Mr. and Mrs. John Holmes of Peru threatening “that unless the Holmes family moved away from Peru their home would be blown to atoms some night while the family was asleep.” Newspapers reported that she was only fined “a small amount” for the offense. Perhaps Hattie should have taken her urge to blow up the Holmes family and written a book instead of the letters. Stephen King's mother was Nellie Ruth Pillsbury. She was a member of the famous Pillsbury family that included the founders of the C.A. Pillsbury Company. A literary cousin includes poet and playwright Robert Frost. Saturday Night Live and Parks and Recreation actress and comedienne Amy Poehler is also a cousin of Stephen King. With Stephen King being an author of horror stories, it was only natural that this family connection was widely reported. But is Stephen King really a descendant? In researching this link, I haven't found a single source that gives the actual descendancy of Stephen King from Jonathan Nason. However there are some online family trees that show a descendancy but with no valid sources to confirm it. Part of the alleged descendancy runs through Stephen's 2nd great-grandmother Susan G. Robinson. Susan is the alleged daughter of George Robinson and Rebecca Grant. Rebecca is the alleged daughter of James Grant and Lois Harding. James is the alleged son of Peter Grant and Mary Lord. Peter is the grandson of Jonathan Nason. The problem is that I have not been able to confirm the connection from Susan Robinson to Peter Grant. In fact, the published sources I have found that list the children of Peter Grant do not include a James Grant putting doubt on the entire connection.